HINDU KUSH (or Hindukush) is the main mountain range in the Central Asian state of AFGHANISTAN. Hindu Kush is the westernmost extension of the Pamir mountain, the Karakoram (K-2), and the western HIMALAYAS. 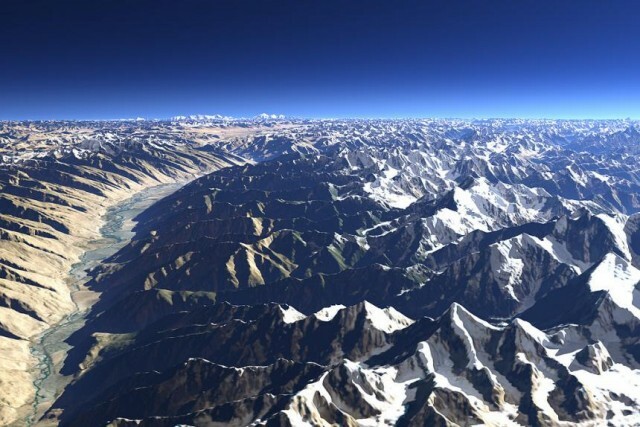 The mountains of the Hindu Kush system diminish in height as they stretch in a westward direction. Toward the middle near Afghanistan’s capital city Kabul, they extend from 14,763 to 19,685 ft (4,500 to 6,000 m); in the west, they attain heights of 11,482 to 13,123 ft (3,500 to 4,000 m). The average altitude of the Hindu Kush is about 14,700 ft (4,500 m). Th Hindu Kush mountain range stretches about 600 mi (966 km) laterally, and its median north-south measurement is about 149 mi (240 km). Only about 373 mi (600 km) of the Hindu Kush system is called the Hindu Kush mountains. The rest of the system consists of numerous smaller mountain ranges, including the Salang, Koh-e-Baba, Koh-e-Paghman, Spin Ghar, Sian Koh, Suleiman, Selseleh-e-band-e-Turkistan, and Koh-e-Khwaja Mohammad. The western Safid Koh, Doshakh and the Siah Band are known as the Paropamisus by scholars of Central Asia. Three rivers flow from the Hindu Kush mountain range, namely the Helmand River, the Hari Rud, and the Kabul River that also provide water to major cities and regions of Afghanistan. Huge caravans pass through high passes (kotal) transecting the mountains. The most important mountain pass in the Hindu Kush range is the Kotal-e-Salang, which links Kabul and points south to northern part of Afghanistan. Before the Salang road was constructed, the most famous passes in the Hindu Kush region were the Khyber Pass (3,369 ft or 1,027 m) and the Kotal-e-Lataband (8,199 ft or 2,499 m). The roads through the Salang and Tang-e-Gharu passes are critical strategic routes between Afghanistan and RUSSIA and other old Soviet republics. The Hindu Kush is sparsely populated and inhabitants subsist year-round on livestock and crops. The Kalash people are one of the main inhabitant groups of Hindu Kush and claim to be descendants of Alexander the Great. They have their own distinctive laws, religion, and culture.